If you haven't seen (or at least heard of) Frozen, then you've been living under a rock! Frozen is Disney's 53rd animated feature and it is loosely based on Hans Christian Andersen's fairy tale The Snow Queen. It won two Academy Awards at this year's Oscars (Best Animated Feature and Best Original Song). The film tells the story of a fearless princess who sets off on an epic journey alongside a rugged, thrill-seeking mountain man, his loyal pet reindeer, and a hapless snowman to find her estranged sister, whose icy powers have inadvertently trapped the kingdom in eternal winter. It might sound like a typical Disney princess movie, but Frozen is very different from it's predecessors and teaches people young and old some pretty valuable lessons. I do not want to spoil the movie for those of you who haven't seen it yet, so I'll spare you the details! I wanted to do a mini-series inspired by Elsa and Anna because I adore this film and these characters, especially Elsa. Not only is she one of the prettiest characters in a Disney movie in like, ever (I've never been so jealous of an animated person), but I relate and connect with her character on many levels. 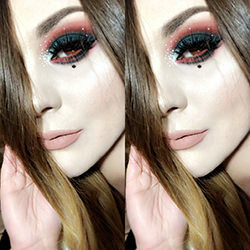 Instead of trying to look like the characters, I decided to create makeup looks inspired by the characters as a whole and also taking inspiration from their surroundings. I gathered inspiration from Elsa's breathtakingly beautiful sparkling gown, her ice castle and the actual makeup she wears herself. I wanted the look to be structured, yet free, much like Elsa after her transformation. I did this by combining sharp lines and soft edges. I feel like the juxtaposition of the two work harmoniously together and help create a magical, icy look. I also added holographic glitter to represent the sparkles of her dress and the shimmering ice and snow that surround her. Here are some gifs and stills from the film to compare and admire! 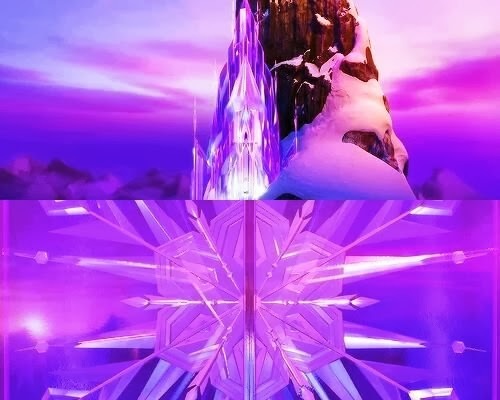 "From the outside, Elsa looks poised, regal and reserved, but in reality, she lives in fear as she wrestles with a mighty secret—she was born with the power to create ice and snow. It's a beautiful ability, but also extremely dangerous. Haunted by the moment her magic nearly killed her younger sister Anna, Elsa has isolated herself, spending every waking minute trying to suppress her growing powers. Her mounting emotions trigger the magic, accidentally setting off an eternal winter that she can't stop. She fears she's becoming a monster and that no one, not even her sister, can help her." She is elegant, powerful, caring, fierce, reserved, regal, warm, protective, kind-hearted, mysterious, and intelligent. I really hope you guys liked this look! I sure had a lot of fun putting it together, especially since I haven't played with makeup like this in a while. I absolutely LOVE this movie and I cannot wait for it to be released on DVD! Of course, I cannot finish this blog post without posting the iconic song, "Let it Go". If you didn't already know, Broadway singer Idina Menzel is the voice of Elsa. She has such a strong and beautiful voice that fits Elsa perfectly. Ugh, it gives me goosies. Enjoy, and let it go! So gorgeous! I gasped when I saw it, and you've done such a stunning job! LOVE LOVE LOVE IT! This is beautiful. I don't own any Sugarpill yet (I know, I knooow) but I am thinking this post has me convinced. I freaking LOVED Frozen! It was WAY better than what I thought it would be like, honestly. I've seen a lot of Elsa inspired makeup looks, but I have to say that yours is definitely my favorite. The colors are so beautiful and your application is amazing, as always! Love it! Its def a Frozen theme makeup. Love the color combos for I find it classy and perfect for any occasion. Great choice indeed! I love this look, Ronnie! It's so unique!